It's my second week as a Guest Designer for Sentimental Sundays. This week the theme is "Cards for a boy/man". I've heard so many people say that they struggle making cards for men and I have to admit that I do as well. But I was up for the challenge! The sponsor this week is QKR Stampede and I chose to use "Hug Me". I loved him the minute I saw him!!! His tie just screamed to be orange and I just went from there. Orange isn't usually a color I use but hey - just go with the flow right? LOL!!! Come on over and join us at Sentimental Sundays. I'd love to see what you create!! Thanks for stopping by! God bless you!! Awesome job on this challenge. What a fun card. Love the image. Oh Zella, I love this card. The layout is perfect and so is the color combo...You did an outstanding job on this card...Perfecto!!! Congrats on your GDT position! This is such an awesome card, love the color combo. Thanks so much for joining us at Flat Friends this month and hope to see you again soon! 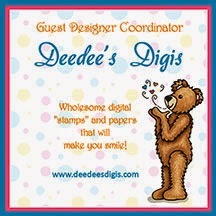 Fab card, love the image and colors! Thanks for joining us at Robyn´s Fetish! Adorable card...love that wild tie! Thank you for sharing your lovely creation with us at paper Crafting Journey. Everything is Coming Up Dasies!